World cruises, designed for the cash rich and time rich, can be an excellent way to tour many destinations on a single voyage. The dream for many cruise addicts, world cruises (or "worldies") are an excuse to escape normal life for several months while exploring new regions of the world. While more cruise lines seek to tap this lucrative market, the added consumer choice can be both a good and bad thing. The new choices can be baffling, but the increase in competition can only help to drive prices down. A ship operating a world cruise starts in one port, circumnavigates the globe, and returns to the beginning. Shorter versions see the ship sailing in depth in a particular region before returning home, rather than circumnavigating the globe. Cruise lines tend to offer world cruises at quieter times in the year. Many will sail between January and April, considered a low season when demand for short cruises drops. Most cruise lines split their long world voyages into shorter sectors. The ultimate experience will obviously be a complete world cruise from start to finish, but this comes with a hefty price tag and time commitment. Instead, booking a single sector delivers the taste of a world cruise but on a smaller time and financial budget. The cost of world cruises, often running into tens or even hundreds of thousands of pounds, together with the time commitment required means world cruises are often a reserve of the retired and the wealthy. When I sailed with Fred. Olsen, passengers told me that taking a world cruise can be a savvy economic decision. While world cruises come with a large initial price tag, the cost savings at home thanks to lower energy bills, no grocery bills, no transportation bills, etc. can offset the cost of the cruise. Cruise ships offer a sense of community, combatting loneliness, and the ships sail to warmer climates, avoiding the miserable winter weather at home. Here are my top picks for 2018. Expect to pay upwards of £10,000 per person for two people sharing an inside cabin on a 100+ night cruise. Luxury suites can command upwards of £135,000 per person based on two people sharing a grand suite. December 2017 - Viking Cruises kicks off the 2018 world cruise season with Viking Sun sailing from Miami in mid-December although its epic 140-night adventure will run until early May 2018. From Miami, the ships travels through Cuba and Mexico to Panama. Sailing up to Los Angeles, the ship then heads across to the Society Islands. New Zealand and Australia follow, before the ship charts a course northwards through Asia. The ship ends in London following a brief tour of the Mediterranean. This is the only world cruise on my list that doesn't end where it begins, although a flight from London to Miami would complete the loop. Details here. January 2018 - Fred. Olsen Cruise Line's Black Watch will sail on a world cruise from Southampton in January. Highlights include calls to Cuba, Peru, Easter Island, Australia and New Zealand, Myanmar, India, and Egypt. A brief tour of the Mediterranean en route to Southampton concludes the 108-night voyage. Details here°. January 2018 - For a whistle-stop tour of the world, head onto P&O Cruises Arcadia for a 99-night cruise in January. Sail from Southampton and take in the major ports on a westerly course. Expect plenty of sea days as the ship quickly rattles through the destinations. Details here°. January 2018 - Fancy an 111-night adventure in January? Embark Princess Cruises' Pacific Princess in Los Angeles for a cruise that takes in highlights on the Americas, Fiji, New Zealand, Australia, Singapore, India, United Arab Emirates, Egypt, and a full tour of Mediterranean hot spots before a transatlantic sailing back to California. Details here°. January 2018 - Regent Seven Seas Cruises' Seven Seas Navigator will also sail from Los Angeles on a 137-night world cruise. Highlights include calls in Hawaii, the Society Islands, New Zealand, Australia, Malaysia, Seychelles, South Africa, Namibia, Uruguay, Brazil, and the Caribbean. Details here. January 2018 - Cruise & Maritime Voyages' Columbus will sail from London Tilbury in January on a 121-night world cruise taking in highlights of South America, the Society Islands, New Zealand, Australia, Asia, Egypt, and a couple of Mediterranean highlights. Expect plenty of lazy sea days on this voyage. Details here. January 2018 - Costa Cruises' Costa Luminosa will sail over 106 nights from Venice around the world in January. Plenty of sea days intersperses port calls in the Mediterranean, Americas, Australia, Indonesia, Singapore, Thailand, India, and the Arabian Gulf. Details here. January 2018 - MSC Cruises hosts its first world cruise in 2018 aboard MSC Magnifica. Passengers can embark on the 118-night voyage in Civitavecchia, Barcelona, or Genoa in January. The westerly itinerary crams in a generous quantity of ports of call, with overnight calls to popular destinations. Details here. January 2018 - 122 nights of navigation await passengers on Cunard's Queen Elizabeth sailing in January. Departing Southampton and heading west, highlights of this itinerary include the Americas, the Society Islands, New Zealand, Australia, Japan, Malaysia, and South Africa. Details here. January 2018 - Cunard's Queen Mary 2 will sail on a slightly longer world tour from New York in January. The 134-night cruise starts with a transatlantic crossing before sailing along South Africa, down to Australia and New Zealand, before heading northwards through Asia. A brief tour of the Mediterranean and a second transatlantic sailing concludes the trip. Alternatively, drop the transatlantic sailings and shrink down the trip to 120-nights by sailing round-trip from Southampton. New York details here and Southampton details here. January 2018 - Oceania Cruises' Insignia will sail from Miami in January on a leisurely 180-night world cruise. Sea days lightly splash the itinerary, breaking up blocks of port visits with some well-deserved downtime. The ship tours the Caribbean, South America, Namibia, South Africa, India, Myanmar, Singapore, Thailand, China, Japan, Indonesia, Australia, New Zealand, the Society Islands, Hawaii, and North America. Details here. January 2018 - Holland America Line's MS Amsterdam will sail from Fort Lauderdale on an 113-night circumnavigation in January. Transiting through the Panama Canal, the ship heads straight to Australia and New Zealand via the Society Islands. Heading northwards through the Philippines, Hong Kong, and Singapore, the ship sails along the South African coastline before crossing the Atlantic Ocean bound for Florida. Details here. June 2018 - Princess Cruises' Sea Princess escapes New Zealand's winter in June for a 106-night global adventure. From Auckland, the ship heads north through Asia to Europe, west to Canada and America, and finally back to New Zealand. Details here°. January 2019 - Silversea's world cruise for 2019 is a journey from 132-day voyage from San Francisco to London. Silver Whisper will call at stunning ports of call in Polynesia, Tahiti, Australia and New Zealand, Indonesia, Taiwan, Singapore, the Maldives and the Seychelles, and along the west coast of Africa, before arriving in Greenwich. Nine writers will be onboard, documenting the journey through short stories. Details here. January 2019 - Crystal Cruise' Crystal Serenity will sail on a repositional world cruise, starting in Los Angeles and ending in Monte Carlo. The 84-night adventure sails from LA in January traversing Hawaii, Australia and New Zealand, Africa, and the Mediterranean. Besides the two-day stay in LA and the three-day stay in Monte Carlo, what sets this itinerary apart from others is the focus on smaller ports of call. Details here. January 2019 - Cruise & Maritime Voyages' Columbus will again sail from London Tilbury in January on a 120-night world cruise taking in highlights of the Caribbean, French Polynesia, Australia and New Zealand, and Asia, before transiting the Suez Canal back to Blighty. Expect lots of relaxing sea days on this itinerary. Details here. January 2020 -Seven Seas Mariner will sail on 131-night itinerary from San Francisco on 24 January 2020. Visit 30 countries spanning six continents, visiting 36 UNESCO World Heritage sites amongst a total of 66 ports. There are 13 overnight stays on this full circumnavigation of the globe at San Francisco, Honolulu, Papeete (Tahiti), Auckland, Sydney, Bali (Benoa), Singapore, Colombo, Mumbai, Luxor, Jerusalem (Haifa), Barcelona, and Hamilton. Details here. January 2018 - P&O Cruises Oriana will embark on a gentle 50-night voyage from Southampton in January, taking in the best of the Caribbean and North America. Details here°. January 2018 - Meanwhile, P&O Cruises Aurora will embark on a 65-night tour of South America and the Caribbean from Southampton in January. Details here°. January 2018 - Cunard's Queen Victoria will sail a 79-night tour from Hamburg charting a clockwise course around South America. A transit through the Panama Canal and a jaunt through the Caribbean sees the cruise draw to an end back in Germany. This cruise is also available as a 75-night starting from and ending in Southampton. Hamburg details here and Southampton details here. June 2018 - In June, Oceania Cruises' Sirena sails round-trip from Miami on an 85-night tour of the Mediterranean. Ports of call are crammed in like sardines, with sea days an occasional respite. Several overnight calls help to relax the pace on this ultimate Mediterranean adventure. Details here. Repositional cruises are a quirk of ship timetabling. Once a vessel completes its season in one location it needs to transit to another. Cruise lines are keen to avoid operating empty ships, so one-off repositional itineraries become available. One-way world cruise sectors often fall under this category. While not a round-trip world cruise, the one-way repositional sailings can cover significant distances and can be an excellent way to tour parts of the world. These vital itineraries are not always the most glamorous or the most popular, so prices are usually very enticing to encourage passengers to book. You will need at least one flight, possibly two, depending on where your cruise starts and ends. You may also choose to extend your holiday with a land-based stay pre- and post-cruise. Many ships sailing in Europe for the summer will reposition to the Americas for the Winter, resulting in two transatlantic repositional itineraries per ship per year. These sailings usually consist of just the transatlantic sailing, a tour of the originating or destination area plus the transatlantic sailing, or a comprehensive itinerary exploring the originating and destination areas as well as the transatlantic crossing. Some vessels head down to Asia and Australia, often with repositional itineraries planned to take in highlights of the Arabian Gulf en route. Many voyages span two to three weeks, with some much longer than that. Costa Cruises' Costa Favolosa moves from Marseille to Copenhagen on a 13-night transit in May, calling at ports along the Spanish, Portuguese, French, British, and German coastlines. June sees a 36-night epic adventure by Pacific Princess as she moves from Fort Lauderdale to Dover. Instead of a simple transatlantic crossing, Princess Cruises has planned a comprehensive tour of North America, Iceland, Britain, Norway, and Russia. Silversea's Silver Whisper sails from London to the diverse city of Montréal. The 17-night journey in August takes in highlights of Ireland, Iceland, Greenland, and Canada. In September, Holland America's Noordam will reposition from Vancouver, Canada, to Sydney, Australia, stopping in Hawaii, Fiji, and New Caledonia along the 27-night voyage. In October, Royal Caribbean's Explorer of the Seas follows a similar path as it sails for 23-nights from Seattle to Sydney. A 17-night adventure for Crystal Cruises' Crystal Symphony sees it transit from Dubai to Mauritius in November. Lazy sea days pair with calls to Doha and Abu Dhabi, the Seychelles, and Madagascar. In December, Oceania Cruises' Marina will sail on a 36-night voyage from Miami to Tahiti, touring South America as well as transiting the Panama Canal, before calling at Easter Island, Fakarava, Rangiroa, Bora Bora, Raiatea, and Moorea. 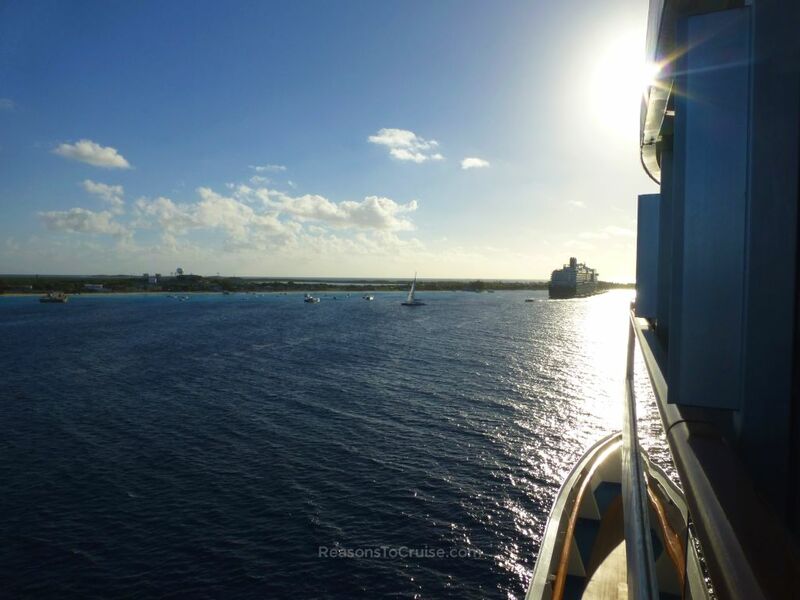 Would you prefer to sail on a round-trip world voyage or a one-way repositional cruise? Let me know your reasoning in the comments below. I will be celebrating my 65th Birthday in January of 2019. I would like to take a Solo Mediterranean Cruise. My question, is this a good month to sail and what options do I have for a solo cruise as well as when should I make the reservations or should I wait until sometime late 2018? The Med doesn’t really have an off-season. The weather is more reliable in Summer but the heat isn’t as intense in the Winter. Depending on which cruise line you plan to sail with, you might be better off booking early to get the best price. Some ships have limited numbers of solo cabins and these get snapped up fast (handy if you want to avoid the dreaded single supplement fee). That said, we’re not far off the peak selling time of January and February, so it might be worth holding off until the “Wave Season” offers go live. In the past these have included things like drinks packages, cabin upgrades, and either reduced or no single supplements. Offers vary by cruise line and won’t usually go live until late November through December.